We know your responsibilities don’t end when you head home for the day. We pride ourselves on giving people the chance to spend time with family and to grow their hobbies – all while developing an amazing career. See how AT&T empowers employees to make the most out of their work-life balance. I’ve been a proud AT&T employee for almost 10 years. In 2009, I started with the company in my hometown of Traverse City, Michigan, as a Sales Rep. Then, I became a Sales Support Rep before I was recently promoted to Legal Assistant. In my spare time, I've always dedicated my life to music – I’ve been singing since I could practically speak. My first ever performance was for a muscular dystrophy benefit at age 6 and I’ve had my own band since I was 17 (the same year I released my first album). I’ve opened for some pretty big acts. AT&T has supported my passion for music for many years. With the help of AT&T, I was able to transfer several times to continue my work with the company and pursue my singing career. One of my more recent transfers was in March 2014 to Austin, Texas, the “Live Music Capital of the World.” My husband, who also works for AT&T, accepted a transfer as a Network Services Manager and I transferred as a Sales Support Representative. Once we made the move to Austin, our dreams started to come true. We had been in a band for the past few years and always dreamed of moving to a city that was more hip to music, with the hopes of recording an album. With the combined income we were now making in Austin, we set out to make an album and proudly released it on March 12th, 2015 – just over a year after transferring. Throughout our careers with AT&T, my husband and I have come across many customers and co-workers whose lives have been touched by cancer. Our lives, too, have been touched by it. We wanted a way to give back to our customers, families, friends and others affected by this disease. With every album sold, we donate a portion of the sales to the American Cancer Society. We shared our story with AT&T back in March of 2015. 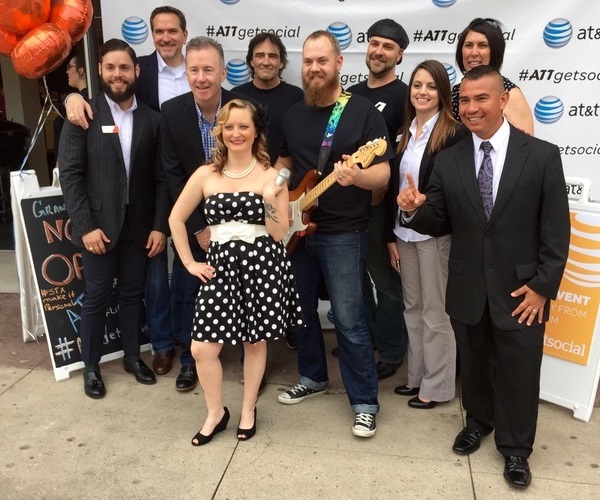 Just when we thought AT&T could not be any more supportive, they surprised us yet again – our band was invited to perform at the grand opening of the AT&T Store of the Future in Austin. Our performance was streamed live and our story was shared on AT&T’s MyCSP employee platform. How do I manage my career as a full-time employee and be a part of a successful band? I keep constant and open communication with my management and build relationships with higher-ups and my teammates. I stay organized and manage all band-related business during my lunch break or after work. I schedule a set day for band practice. And, if there is a date we’re playing a gig that might conflict with work, I use vacation time and schedule in advance. I’m a prime example of someone who works for this incredible corporation and moved up in her career, all while maintaining extraordinary work-life balance. I’ve achieved many dreams with AT&T and look forward to many more. Thank you to AT&T for all your support – and all that you do! Learn more about our Retail team.